The planned blogging break for my sister’s wedding lasted slightly longer than expected, but it’s Monday and we’re back! Maybe it had something to do with the breakneck pace of wedding activities, the 14 hour drive to Dallas or the craziness that comes with being the Co-Maid of Honor AND the cake vendor. Whatever the cause, I returned home last week exhausted and sporting an old fashioned cold that had me down for the count. Many thanks to you for waiting patiently for new posts! Now, let’s get to the good stuff. As promised, today I have photos from Ashley and Dustin’s wedding. It was a beautiful day filled with family, friends, love and laughter. Chocolate Brown and Tiffany Blue provided a modern color scheme accented by elegant Calla Lilies. My sister and I both agree that often ‘less is more’ and you can clearly see her clean style throughout this event. Simple, modern and elegant – it was just perfect. I just love the photo of my dad and sister as they enter the church. 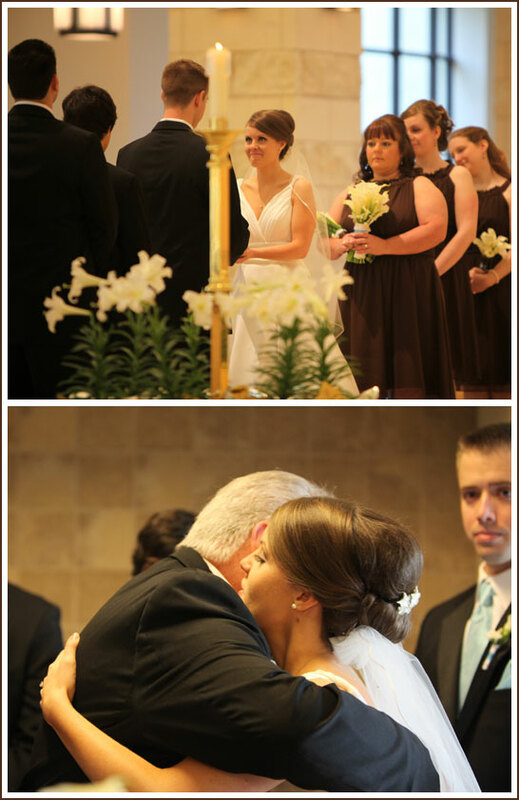 Tears are soon to follow… from Ashley, from Dustin, from my dad, from just about everyone. At least I wasn’t the only one reaching for a tissue. I’ll spare you from the images where I’ve really got the water works going! The couple’s custom monogram was used throughout the wedding to create a cohesive look starting with the Save the Date cards all the way through to the reception. Favor boxes from Beau-coup were topped with a monogram along with flower vases, cookies and food labels. Guests were encouraged to label their wine glasses with monogrammed wine charms. We also incorporated the monogram into the design of the groom’s cake and bridal cake stand. The bridal cake flavors included French Vanilla cake with Dreamsicle filling and Chocolate Chip cake with Chocolate Buttercream filling. The groom’s cake was Dark Chocolate cake with Chocolate Espresso filling. Everything was simply beautiful, from the bride to the ceremony, reception and photography. Incidentally, I was not the only family member doubling as a wedding vendor that day. My sister-in-law has always had a knack for photography and we gently twisted her arm into sharing her talent for the big occasion. While she’s had plenty of experience over the years taking creative photos of her own children, this was her first wedding. And as you can see, she absolutely rocked it! Not to mention the stellar engagement photos she took (see their Save The Date card for an example). So if you’re in the Houston area, remember the name Cathy Planka. If she starts doing events for non-family members, I’ll definitely let you know! Congrats again to Ashley and Dustin! We love you and couldn’t be happier for you both! Amazing!!! Everything looks so classy and elegant and perfect!! WONDERFUL!!! I love this color combination! What a beautiful day! Beautiful! Can’t believe I missed it. Love the monogram pulling everything together! Awww, 04.10.10 was my 6th wedding anniversary! Everything ties together so well! Looks like it was a great day! Just lovely! Congrats and best wishes to your sister! Absolutely fascinating! Wonderful photos, such a beautiful bride. Love the colors! Everything looks amazing, from the colors to the simple details, to the couples monogram. And the cakes are simply beautiful…great job! This is so lovely. Your details/cake are perfect! How beautiful! Chocolate chip cake sounds delicious! Looks goorgeous! The bridesmaid at the front looks very much like that lovely actress who played ‘sukie’ in Gilmore Girls! I LOVE this!! I have also been looking at the photos from Ashley’s bridal shower and must admit that I’m stealing some of your ideas 🙂 My best friend is getting married in October and her colors are very similar. I am just wondering, where did you find the cute little monogrammed circle labels? I need them!! lol.